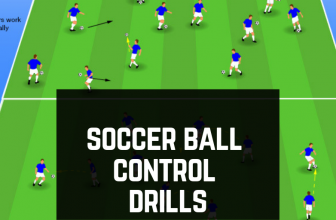 What soccer player couldn’t benefit from having better ball control? 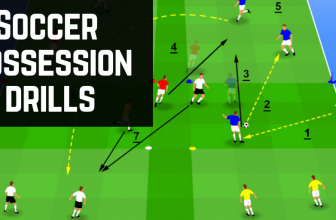 The drill routines illustrated here reflect some of the most ball control fundamentals that every soccer player should have. 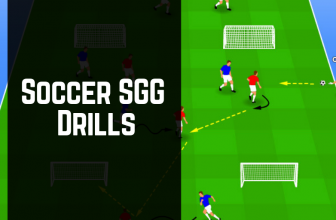 Mastery of these will undoubtedly help your players to improve their game by sharpening key skills and give them the necessary tools to make each time they step on the field better than the last. 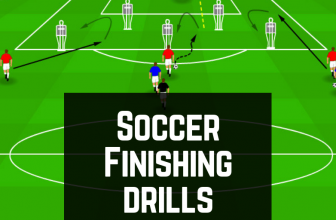 All you need for these drills are are a bunch of soccer balls, cones and some pinnies. 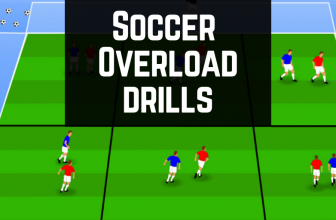 What Soccer Drill Software Am I Using? Very little equipment needed for this one and it’s a great drill if you have a large group. Give each players a ball and cone. The cone acts as an imaginary defender. Players perform various skills using the cones as the ‘defender’. 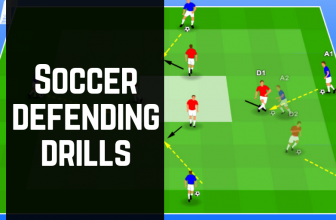 Let your players choose their drills and only stop to add in stop coach points such as; dribbling into space when the ‘defender’ has been beaten. For the most part let your players explore on their own with this one. 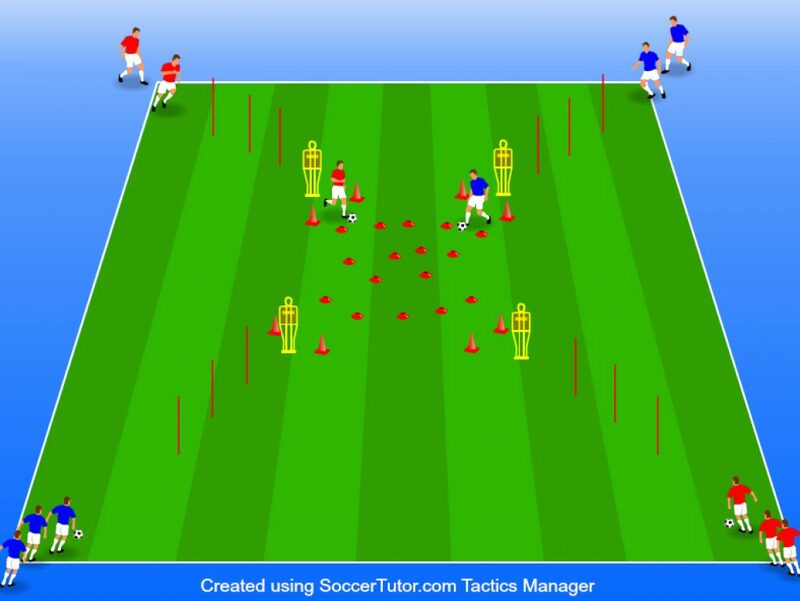 Setup 4 cones in the middle and then split your group up and place then at equal distance around the area of play. The initial setup of this drill is very simple. But the real power of the drill comes from the rules you impose on the drill as you progress. You can get creative with this one to really challenge your players. Players must dribble to the middle cones, perform a turn and then dribble to the next cone. Variation #4: Left foot ball control while going anti-clockwise. This is a great drill especially for really younger age groups. It can still be used with older age groups however. You can adapt the drill making the direction of play more complex. Use whatever equipment you have to setup an obstacle course where players must use small touches to keep control of the ball. For this example; players dribble the ball through the obstacle and make a pass to another player on the opposite corner with the same color pinnie. Setup 2 areas; one smaller boxed off area and then the area outside. Split your group into two teams; place one team on the outside of the middle and then place the rest of your players on the inside. The drill is simple; players in the middle must receive the ball and make a chain of 3/4/5/6 etc turns before passing the ball to someone else on the outside. So for example; a blue player might receive the ball and perform a cruff turn, drag-back and outside chop before passing the ball to another red player. Make sure each team takes it in turns. Variation #1: As this drill works on individual skills and ball control, progress and regress the drill by changing the size of the middle box. This is a small progressive ball control drill that works especially well with younger age groups. Each player starts with a ball each and practices controlling the ball from different angles, heights distances and ball flights. This drill can be used to improve players control of the ball from different angles, heights and ball flights. Variation #2: Pairs: 1 ball between 2 to vary the distance, height and trajectory Ronaldo 7 ‘Game’: left foot – right foot – left thigh – right thigh – left shoulder – right shoulder – head. All 7 touches without letting the ball drop. 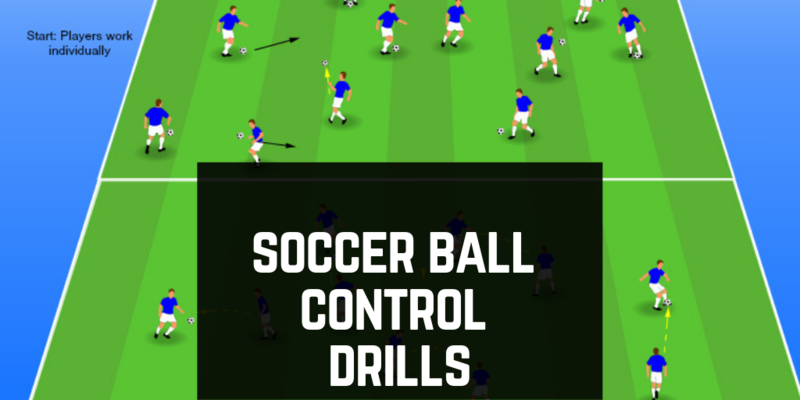 Here’s 13 more ball control drills that can be used whenever you get your players to work in pairs. 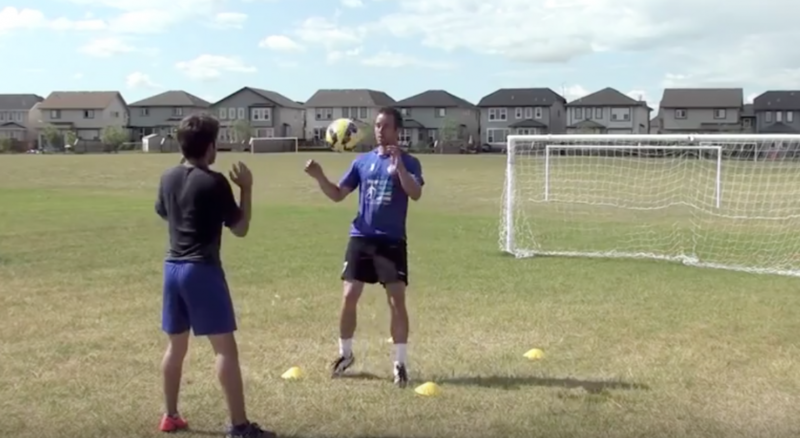 While the drills in this video take a very static approach to developing ball control (that is, one player standing in front of another feeding the ball) you can use these same exact drills and incorporate them into some of the more complex drills above. Player A will lob the ball to Player B at hip level. Player B will line up at the back end of the rectangle. As the ball approaches, Player B will return it to their partner by kicking it with the inside of their foot. Alternate feet with each return. Much like Drill One, Player A will once again throw the ball at hip level. Player B’s return will be made using the laces of their foot from the back of the rectangle. Alternate feet throughout the drill. Player A passes the ball at his level again. This time Player B is going to return the ball using the outside of their foot. Player B will do this by bringing their foot up to hip level and striking the ball with the outside of their heel. As Player A passes the ball to at hip level, Player B has to cushion it with their knee and then return it with and inside the foot kick. This time Player A will pass the ball at chest level. Player B’s job is to cushion the ball with the chest and then return it with the same inside the foot kick as before. This time Player A will pass the ball at head level. Player B’s job is to return the ball to partner using only their head. Get your players to strike the ball with the front portion of their forehead above your eyes. For this drill Player A will again pass the ball at waist level. Starting at the back of the rectangle, Player B returns the ball with an inside the foot using the left foot. Immediately following this return, Player B takes three quick steps in succession to the top of the rectangle and makes another return again using your left foot. Three quick steps bring you back to the rear of the rectangle where Player B will repeat the process, though this time they will use their right foot. Alternate feet after each set of two returns with the same foot. This drill asks your players to bounce the ball instead of throwing it at hip level. Player B’s job is to again rotate from the rear of the rectangle to the top returning the ball to using the inside of your foot each time. Use the same process as you did in Drill Seven to determine which foot to use. Returns are made in the same order as before according to foot selection and movement. The only change here is that players will return the ball using their laces this time the same as in Drill Two. This drill again follows the same premise as Drill Seven. Players will also use the return method practiced in Drill Three where you use the outside of your foot. You will once again follow the premise of Drill Seven for this drill. The only change will be that players will practice using the knee cushion/inside foot return they used in Drill Four. Use the process of Drill Seven to complete Drill Twelve. The adjustment here will be the addition of a chest cushion/inside foot return. This is the same skill practiced in Drill Five. This final drill asks your players to follow the same return pattern of Drill Seven, though Player A will pass the ball at head level. The only change in the final drill is that players will practice returning the ball once more with their head.